Okay, so I’m actually a month late on that. Sadly, my birthday fell on the Day of Atonement this year, which meant no food or water all day. So the next day I made these cupcakes as my birthday treats for work. It was one of the first recipes I pinned when I joined Pinterest, and I’ve been dying to find a special occasion for it. I took some liberties with the recipe, though I’d like to try the regular one sometime. Since I had just made peach jam, I used that in place of the apple butter. And I added a little almond extract both to the cake and the batter, and added a little cinnamon to the batter. Mmmm, peach, cinnamon, and almond…can’t be beat! Preheat the oven to 350. Then cream together the butter and sugar until fluffy. Add the eggs one at a time, scraping down the sides as necessary to combine everything. I also added a half teaspoon to maybe a teaspoon of almond extract at this point. Add the baking soda, baking powder, vanilla, almond extract, and salt, making sure it’s evenly distributed. Mix on medium-high for about a minute, until good and creamy. Finally, alternate adding the milk and flour (to avoid lumps) until everything is combined. Fill lined cupcake tins about two-thirds of the way full. The recipe says to make little craters in the batter and then spoon in the jam. For me, I tried making craters and failed, so I just spooned the jam in and tried to cover it a little with some of the batter (yes, I used my fingers). Ultimately it doesn’t matter, the batter should expand over the jam as it bakes, so don’t worry about it. Now we’re ready for action. Bake for 22-25 minutes. They should be kind of golden, and firm to the touch (when you press them, they should bounce back). Remove them from muffin pan and set them on a rack to cool. 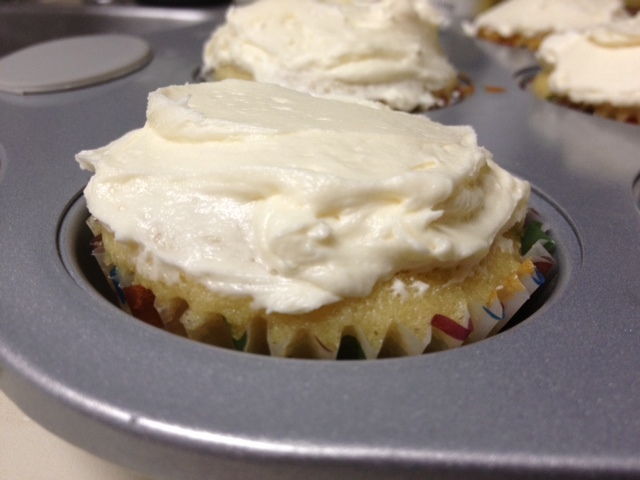 While the cupcakes are cooling, make the buttercream frosting. Whip up the butter for a minute or two, you want it good and frothy. Add in the almond extract and vanilla as well. Add the powdered sugar a cup at a time, scraping down the sides as you go. Really whip it good, as Devo might say. Once the cupcakes are cool, frost with the buttercream. Add a dash of cinnamon to the top, and you’re ready for an epic birthday celebration! Pre-heat the oven to 350 degrees. Cream together the butter and sugar until fluffy. Add the eggs one at a time and mix until combined, scraping the sides of the bowl as necessary. Add the baking soda, baking powder, vanilla, almond extract, and salt and mix for about a minute, on medium high, until creamy (be sure to scrape down the sides of the bowl once or twice, to ensure everything is getting worked in). Then add the milk and flour, alternating between the two ingredients (to avoid lumps) until the batter is smooth. Fill paper-lined cupcake tins so they’re about 2/3 of the way full. Make a small crater in the center of the batter and spoon a dollop of jam into it. Use the back of a spoon or your finger to gently spread a little bit of the batter back over the jam. If you can’t get it covered back up, that’s okay—as it bakes the batter will expand and cover it up. Bake for about 22-25 minutes, until the cake is golden and set (if you gently press with your finger, it should bounce back). Allow the cupcakes to cool while you make the frosting. For the buttercream, whip up the butter for a minute or two to get it good and creamy. Add the vanilla and almond extract. Then add the powdered sugar a cup at a time, scraping down the sides of the bowl between additions to make sure everything gets mixed well. 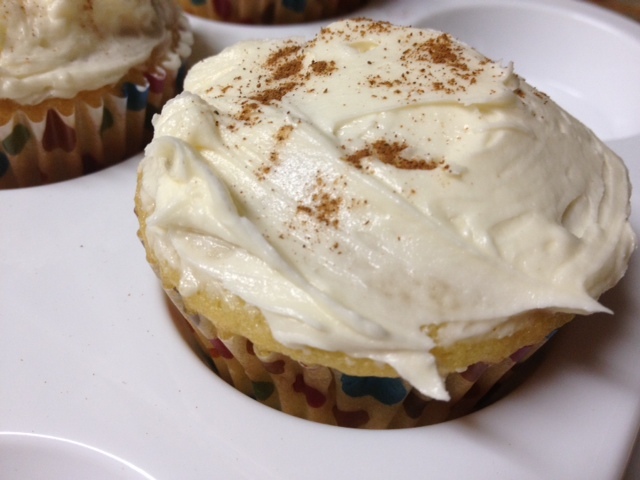 Once the cupcakes are cool, frost them, then sprinkle with a little bit of cinnamon.